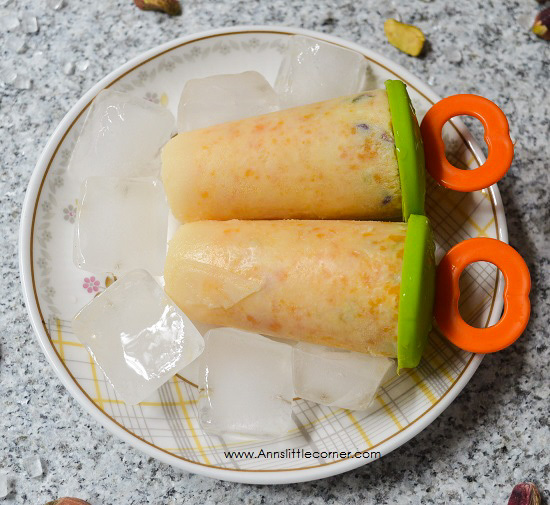 Kulfi is frozen milk based dessert. Kulfi is similar to icecreams or popsicles. They have a creamy texture. Similar to icecreams kulfis have a great demand in summer. Serve a slice of awesomeness to beat the hot summer heat. 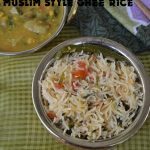 There are so many variation in preparing a kulfi. Using Milk, Condensed milk or khoya. I have prepared using full fat milk. Any fruit or nuts can be added which makes the kulfi richer and flavourful. I have used Mangoes and Pistachios. 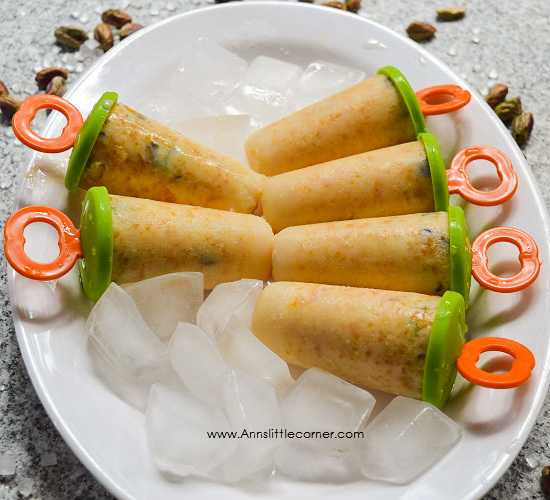 Any variety of mangoes can be used to prepare this Pistachio Mango Kulfi / Mango Creamsicle. 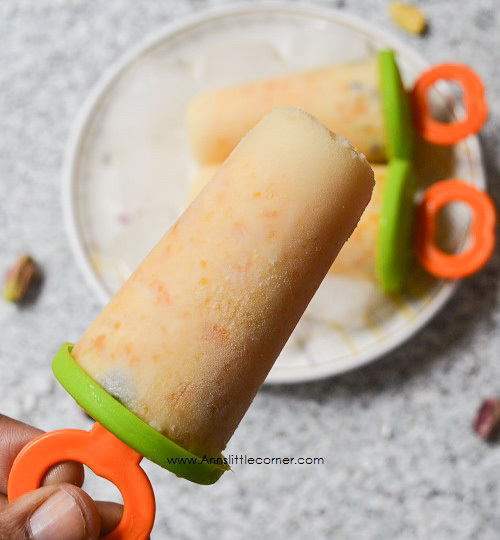 Checkout other Popsicle Recipes in this space. 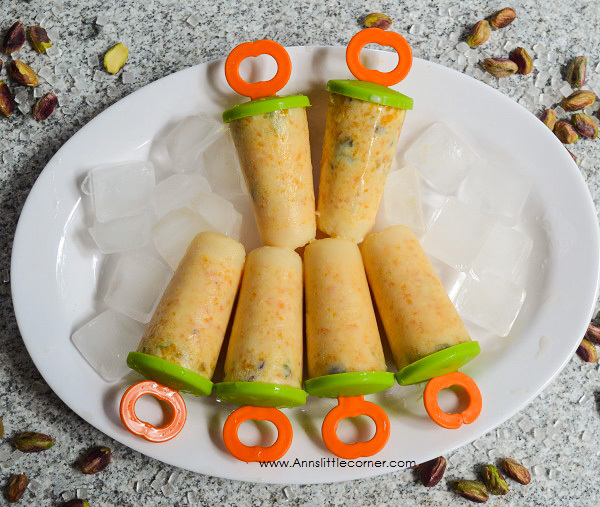 Pistachio Mango Kulfi / Mango Creamsicle is a seasonal dessert in summer. Heat milk in a saucepan. Bring it to boil. Simmer the flame. Simmer it until the milk reduces upto 1 cup. Add in the cardamom powder. Boil for another 2 minutes. Chop the nuts. Add them into the milk. Cook for a minute. Switch off the flame. Add in sugar to taste. Switch off the flame. Chop mangoes and blend them into a smooth paste. Add the mango paste into the milk. Mix them gently. Get ready with the kulfi mold. Fill them. Freeze them for 6 hours to overnight. Check if the kulfis are hardened. Remove them from the freezer. Hold them in running water for 1 minute. Remove them gently from the mold. The Number of popsicles completely depends on the size of the popsicle mold used. After freezing the sweetness reduces so adjust the sweetness accordingly. My mangoes were little fibrous hence they did not blend well. Non Fiborous mangoes like alphonoso would blend smooth and change the color of milk. The color of the kulfi depends upon the type of mango used. Heat milk in a saucepan. Bring it to boil. Simmer the flame. Simmer it until the milk reduces upto 1 cup. Add in the cardamom powder. Chop the nuts. Add them into the milk. Cook for a minute. Switch off the flame. Add in sugar to taste. Get ready with the kulfi mold. Fill them. Freeze them for 6 hours to overnight. Check if the kulfis are harderned. Remove them from the freezer. Hold them in running water for 1 minute. Mango kulfi is now ready. Excellent and very delightful kulfi, feel like relishing some.